16 teams played in the second round of the Class 5A playoffs and only eight of those teams will advance to the next round. For the eight teams that lost this week, their season is over, but for the eight teams that move on to the next round, those particular teams have one goal. That is to be one of nine teams in the end holding a state championship trophy in the Mercedes-Benz Superdome with the Queen smash hit “We Are the Champions” playing in the background. For Louisiana football fans, this is the most wonderful time of the year. It is our version of “March Madness”. This year, we got you covered as for the next couple of weeks. We will go through all of the matchups from 1A all the way to 5A each and every week leading up to the All-State Sugar Bowl/LHSAA Prep Classic from December 7th-9th. We weren’t able to get in our 5A playoff preview before the games started, but we will give you a quick recap of the games and what actually went on before we give out our third round and semi-final previews later today. #1 West Monroe Rebels (12-0) defeats #17 Dutchtown Griffins (7-5) 49-21. Game Recap: No matter how close it is, the most important thing for the West Monroe Rebels is to escape a hostile environment against a very good Dutchtown football team and that is exactly what the Rebels did, but it was not easy. After the Rebels struck an early 7-0 lead with a Cameron Wright touchdown run, the Griffins defense frustrated the explosive Rebel offense to three straight punts. On the third punt, a high snap forced West Monroe freshman punter Javorius Harris to try and keep the ball. As a result, the Griffins got the ball at the Rebels’ 25 yard line and two plays later, the Griffins took advantage of the special teams bluff and tied the game up at seven a piece with Dutchtown QB Dreylon Monroe running it in the end zone from a yard out. Then, the Griffins took advantage of another West Monroe mistake on special teams as on the ensuing kickoff, no West Monroe player fielded the kick and as a result, Dutchtown’s Van’Shon Grayson recovered the ball at the Rebels 13 yard line. The Griffins, then took the lead with a touchdown pass from Grayson to WR Reggie Spears to make it 14-7, but that was as good as it was going to get as West Monroe star QB Slade Bolden (Alabama commit) got the Rebels offense rolling scoring on five straight possessions. On those possessions, Bolden ran for three touchdowns and threw a 37 yard touchdown to Jairus Henry. He finished the night with over 114 rushing yards and 100 passes to go along with the four touchdowns. For Dutchtown, losing senior QB Ben Mays was a big lost as the Griffins had to run a two quarterback system with Monroe and Noah Gray, which was ineffective against the Rebels with a combination of 138 total yards of offense and averaging less than one yard per carry on over 35 attempts. The Rebels also added a interception for a touchdown by Charles Norman to add exclamation to the breakout performance in the second half with a 49-21 win to move on to the next round. For the Dutchtown Griffins, it was a great start for Guy Mistretta‘s first season as the Griffins finish the season with a 7-5 record and a playoff victory. There should be a lot of good things to come if you are a Dutchtown fan. For Jerry Arledge and the West Monroe Rebels, they continue their undefeated season and march to the Superdome this week to play against the #9 seed Barbe Buccaneers in the quarterfinals. #2 Covington Lions (12-0) defeats #15 Ouachita Parish Lions (7-5) 35-28. Game Recap: This was one of the most intriguing #2 vs. #15 matchups that you would see as the Covington Lions, led by Greg Salter, are one of the best teams in the entire state as they have a 11-0 record heading into the team’s second round playoff game while the Ouachita Parish Lions, led by Jeff Fitzgerald, are arguably the best 7-4 team in the state heading into the game especially when the Lions play teams like West Monroe, Richwood, Sulphur, Plaquemine, Neville, and Ruston just to name a few. Early on, the Lions struck on a big play with a 80 yard touchdown pass from Josh Alfaro (Houston Baptist commit) to Jeremiah Driver to give Covington the early 7-0 lead. This score occurred after the Lions’ defense had a goal line stand. The Ouachita Parish Lions answered early as QB Jabari Johnson threw a screen to Dylan Roberts for 54 yards to tie the game up, but then, Covington began to dominate the football game. The onslaught started on the ensuing kickoff return by Milton Clark, who returned the football 90 yards to set up an Alfaro touchdown run later to give the Lions back the lead. Then, Milton Clark had a nice interception, which resulted in a Devin Brumfield (Texas Tech commit) touchdown run to give the Covington Lions a 21-7 lead. After another goal line stand by the Lions’ defense, the offense took advantage even with the long field as the Lions decided to go into its bag of trick plays with Devin Brumfield throwing a pass back to his quarterback Josh Alfaro. The play worked to perfection as it resulted in a 67 yard touchdown to give the Lions a three touchdown lead. Ouachita Parish suffered three costly turnovers in the first half that allowed Covington to hold a big halftime lead. In the second half, Ouachita Parish played a lot better as the team got back on the board with a touchdown pass from Johnson to Jake Hammond to cut the lead to two touchdowns. Covington scored another touchdown while giving the ball to their record breaking tailback Devin Brumfield for a 15 yard touchdown to give the Lions a 21 point lead again. Even with Covington dominating the football game for the first three quarters, Ouachita Parish made things really interesting in the fourth quarter as Jabari Johnson and company got going on offense first with a ten yard touchdown pass to Josh Newton with just over nine minutes remaining and then a 36 yard touchdown pass to C.J. Brown with just over three minutes left to make it only a one touchdown football game. Then, Ouachita Parish got a stop on defense giving the offense a chance to either tie the game or win the game with a touchdown and a two point conversion. That opportunity failed as Johnson overthrew everybody in the end zone as time expired. Covington held on to defeat Ouachita 35-28. Jabari Johnson was the main playmaker for Ouachita Parish as he threw for 256 yards and four touchdowns. Alfaro only threw one completion the entire game which was the touchdown pass to Driver early in the first quarter, but he scored anyway possible on offense throwing for a touchdown, running for a touchdown, and receiving a touchdown. Covington relied heavily on their star running back Devin Brumfield, who carried the ball 27 times for 151 yards and two touchdowns while also throwing the touchdown pass to Alfaro. For the Ouachita Parish Lions, it was another solid season as the team won a playoff game and ended their season with a 7-5 record. For the Covington Lions, they will advance to the Class 5A quarterfinals where they will travel to play #10 seed Hahnville. Game Recap: The Acadiana Rams, under the leadership of Ted Davidson, entered their second round playoff game with a 10-1 record and were looking to win their 29th consecutive playoff victory at home, but they would have their toughest challenge yet against the defending Class 5A state champion Landry Walker Chargin’ Buccaneers led by Emanuel Powell. The Acadiana Rams punched the Chargin’ Buccaneers in the mouth early on using their veer offense as the Rams had a the ball for over four minutes on an eight play, 76 yard drive that resulted in a Dillon Monnette touchdown run to give the Rams a 7-0 lead. Then, on the ensuing kickoff, the Rams recovered a sky kick to give their offense the ball back. A couple of plays later, the Rams scored another touchdown, but this time it was through the air with a Jaylon Borel 23 yard touchdown pass to Hunter Tabb to take the 14-0 lead. The Chargin’ Bucs would respond as defensive back converted QB Corione Harris (Kansas commit) threw to a wide open Bobby Morgan 38 yards for the touchdown to cut the lead to half, but it was still the Rams that owned the first half. After a nice run by Acadiana RB Ziggy Francis for 35 yards, RB Kablen Shelvin punched it in the end zone to give the Rams a 14 point lead once again. Another special teams miscue by Landry Walker costs points as a muffed punt recovered by Acadiana resulted in a late first half field goal to put the Rams up by 17, but there was still two minutes left to go in the half and the Chargin’ Bucs moved the ball down the field 80 yards. With 11 seconds left in the half, Harris threw a jump pass to star WR Devonta Jason (Kansas commit) for the touchdown to shrink the Acadiana lead to ten. That late first half touchdown gave some momentum to a Landry Walker team going into the second half. The score remained that way after a quiet third quarter, but things got very tense when Harris ran nine yards for a Landry Walker touchdown to make it 24-20. After a great defensive stand by the Rams defense with just four minutes remaining in the football game, Landry Walker’s Devonta Jason had a perfect punt which ended up at the one yard line. 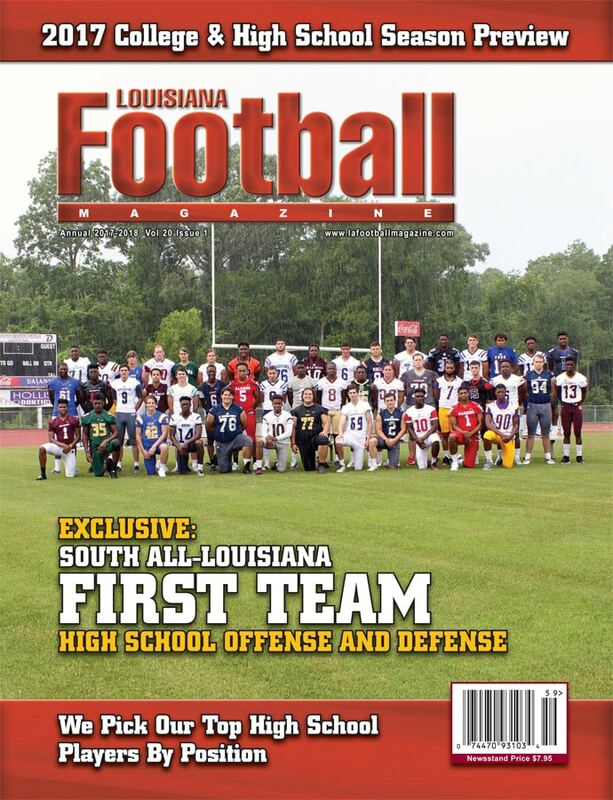 Instead of giving great field position to Landry Walker being backed up at the one yard line or risking a fumble in the end zone, Acadiana Head Coach Ted Davidson made the interesting decision to take the safety and give Landry Walker two points so they can go the length of the field to get a victory. With just over 2:17 left to play, it was up to the Acadiana defense to take a stand and avoid a 17 point comeback. Unfortunately, for Landry Walker, after gaining a first down, the offense committed two penalties, which eventually put them in a fourth down and 20 situation. Harris was looking to try and find Jason, but the pass was intercepted by Acadiana’s Kanyon St. Julien to preserve the 24-22 victory. The Acadiana Rams improve to 11-1 and will continue their impressive home playoff winning streak. The Rams will play the #11 seed Live Oak Eagles on the road in the next round of the playoffs. For the Landry Walker Rams, their quest for a second consecutive 5A state championship comes to an end. This was a very talented football team with a lot of big time recruits such as Jason, Harris, and others, but losing QB Keytaon Thompson (Mississippi State) really hurt the team this year. However, it was still a very successful season with the Chargin’ Bucs winning eight games and a playoff game. #4 Zachary Broncos (10-2) defeats #13 John Ehret Patriots (8-4) 38-0. Game Recap: This second round playoff matchup between the Zachary Broncos and the John Ehret Patriots would be a rematch of the 2015 Class 5A state championship, which was won by the Zachary Broncos. Just like the first game, it would be the Zachary Broncos that would dominate the game from start to finish. On the Broncos’ first offensive play, RB Darweshi Sanders set the tone of the football game with a 37 yard touchdown run to give the Broncos the early 7-0 lead. 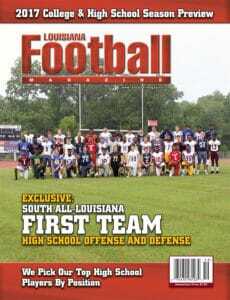 It was a sign of bad things to come for the John Ehret Patriots. Just like Lindsey Scott (LSU/EMCC) had a field day against the very good John Ehret defense, sophomore star QB Keilon Brown had a very similar game. Brown only had six completions, but three of those completions resulted in deep touchdown passes of 94, 42, and 68 yards. Overall, Brown threw for 224 yards, three touchdowns, and a touchdown run. One of Brown’s touchdowns passes was a huge back breaker and most likely, the key play of the entire game. With Zachary still holding a 10-0 lead in the second quarter, the Broncos were pinned inside their six yard line. That is when Brown rolled out and threw a deep pass to WR Chandler Whitfield who outraced everybody to the end zone to take the 17-0 lead. Not only did the Broncos had success in the passing game, but the Broncos got going in the running game with Sanders averaging over 17 yards per carry and 177 yards. Meanwhile, the defense was dominant frustrating John Ehret QB Travis Mumphrey all night with three interceptions and giving up no points to help pitch a 38-0 shutout victory. It was a perfectly played game by Zachary as they dominated in all three phases of the football game. For the John Ehret Patriots, it was not the showing that the team was looking to make, but overall, it was a very good season considering what the Patriots had to go through early in the year losing their head coach Corey Lambert before the start of the season. A lot of credit goes to Dell-Lee Collins, who righted the ship and led a very talented John Ehret football team to an 8-4 overall record and a second round appearance. For David Brewerton and the Zachary Broncos, this will be the fifth consecutive year that the team will practice on Thanksgiving week as they get ready to make the trip to play #12 seed Airline on Friday. #12 Airline Vikings (9-3) defeats #5 St. Amant Gators (10-2) 35-28. Game Recap: The St. Amant Gators were riding high into the playoffs with a district championship and a 10-2 overall record while the Airline Vikings have found new life after their 44-7 loss to Evangel Christian as well as losing their starting QB Brad Fream in that game. The Vikings have won their last five football games heading into this game. The offense has been sparked by backup QB Jordan Gladney. It was clear that both Airline and St. Amant were going to lean on their best offensive players in Airline WR Coby McGee and St. Amant RB Cade Nelson. In the first half, however, it was McGee that was making the plays and doing the most damage. On the first play of the game, McGee caught an 80 yard touchdown from Gladney, which started the type of performance that he was going to have. McGee also scored on a 77 yard touchdown run as well as a controversial 14 yard touchdown catch in which he caught the ball in the end zone, but the ball was ripped out by a St. Amant defender towards the end of the play. Still, the touchdown counted and McGee had three touchdowns already in one half. For Nelson, it was tough sledding in the first half as he only had 23 rushing yards only averaging just under two yards per carry. Nelson also was involved in Airline’s other first half touchdown as the Gators attempted a halfback pass with Nelson, but the pass was intercepted by Airline DE Matt Salinas 65 yards for a touchdown. At the end of the first half, the Vikings led the Gators 28-7, but there has been a current theme among the other 5A games that the losing team was going to come back and that is exactly what happened. On the first St. Amant possession in the second half, Nelson ran for more yards on that drive than he did in the first half with a 57 yard touchdown run to make it a 28-13 game. In the fourth quarter, Nelson flexed his muscles after witnessing McGee make his plays in the first half. Nelson ran for two touchdowns and made it a 28-26 game. Knowing that the Gators needed two points to tie the football game, St. Amant Coach David Oliver decided to go for two to tie the football game. The Gators converted the two points on a crazy play where Nelson flipped the ball to WR Grant Alexander, who then threw the ball back to QB Halen Miller in the end zone to complete the two point play. The score was tied and you could feel that there was some Gator magic at the Pit once again until that magic was taken away by Airline who finally scored a touchdown in the second half to take the lead at 35-28 when Gladney threw a touchdown pass to a wide open C.J. George for a 68 yard touchdown. There was still plenty of time left for the Gators as there was way over three minutes left in the game, but the Airline defense stuffed the Gators forcing a turnover on downs and running the clock out to complete the upset victory on the road. For the St. Amant Gators, it was a great season as the team won a district championship as well as ten wins. It is especially impressive that the team does not have a lot of big time prospects, but it was a great team that played well together. For Bo Meeks and the Airline Vikings, they continue their hot win streak at six games and will hope to keep it going against the #4 seed Zachary Broncos. #22 Live Oak Eagles (7-5) defeats #6 East Ascension Spartans (9-3) 34-26. Game Recap: The Live Oak Eagles entered their second round playoff game on a roll. After losing five straight games in the middle of the season, the Eagles have caught on fire as the team won four straight football games including their first round upset playoff victory against #11 seed Sulphur. The Eagles were looking to do it again against a very talented and big East Ascension team that only had two regular season losses during the season. Early on, the game could not started any worse for Live Oak as after the Spartan defense held the Eagles to a three and out, the Spartans’ RB Nick Massey took a hand off on a third down play to score the 67 yard touchdown to give East Ascension an early 7-0 lead. Then, Live Oak FB Kee Hawkins fumbled the football, which was picked up by East Ascension’s Adrian Johnson to put the Spartans up 14-0 with just over three minutes played in the first quarter. At that rate, it sure looked like East Ascension was going to run away from the Eagles, but the Eagles didn’t quit. After a nice return by Wesley Daigle, it set up the Eagles with good field position. The Eagles did capitalize on the return as Hawkins avenged for his mistake scoring the team’s first touchdown to cut the Spartan lead to seven. Right before halftime, the Eagles did tie the football game at 14 with a touchdown run by RB Khalil Smith. However, the Spartans got back the lead with their explosive playmaker Jimel London making a big play on special teams with a 78 yard return gives the Spartans to make it 20-14. The Eagles really got their offense going on a long twelve play drive that resulted in a QB Sal Palermo one yard touchdown run to give the Eagles their first lead of the football game as well as a lot of momentum. However, the Spartans took some of the momentum back on third down and long when QB Jason Wakefield threw a long 81 yard touchdown pass to Shaivonn Robinson to give the Spartans back the lead. The Eagles played ball control offense in the fourth quarter scoring thirteen unanswered points in the fourth quarter. On both touchdown drives, the Eagles burned almost eleven minutes off the clock with both touchdowns coming from Hagen Long one from 25 yards and the other from a yard away. As a result, the East Ascension offense only had the ball just over a minute in the fourth quarter. The Spartans did drive the ball down the field and had a chance to tie the game with a touchdown and a two point conversion, but Wakefield’s pass to Massey came short of the goal line. That preserved the upset victory for the Live Oak Eagles. The Eagles option attack was too much for the Spartans as the team ran for over 400 yards including 100 yard performances from Palermo, Hawkins, and Smith. Besides giving up the two big offensive plays, the Live Oak defense was very solid all game long only giving up 56 total yards besides the two touchdown plays and the long final drive at the end of the football game. The Eagles also dominated the time of possession holding the ball for over 32 minutes. The East Ascension Spartans, under Darnell Lee, finished their season with a 9-3 overall record. The Live Oak Eagles, under Brett Beard, improve to 7-5 and will advance to the Class 5A quarterfinals for the first time in school history as they will face the #3 seed Acadiana Rams. #10 Hahnville Tigers (10-2) defeats #7 Ruston Bearcats (8-3) 23-21. Game Recap: This was arguably the most intriguing 5A matchup as one of the best teams in North Louisiana in the Ruston Bearcats, led by Jerrod Baugh, play one of the best teams in South Louisiana in the Hahnville Tigers. 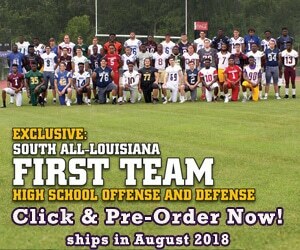 It also provides a great matchup between one of the best offensive playmakers in Hahnville’s Anthony “Pooka” Williams and one of the best defensive players in North Louisiana in Ruston DE/LB Tahj Samuel. Whoever wins that matchup will go a long way in determining the outcome of the game. Well, Samuel and the Ruston defense had a tough time stopping or even slowing down Anthony “Pooka” Williams, who carried the ball 42 times for 303 yards and three touchdowns. Even with the outstanding performance by Williams, the Ruston Bearcats were still alive in the football game and even took the lead late in the third quarter with a touchdown pass from C.J. Willis to Donald Johnson to put the Bearcats up top at 21-20. Another intriguing battle that played a major factor in the football game was the matchup between both team’s kickers. 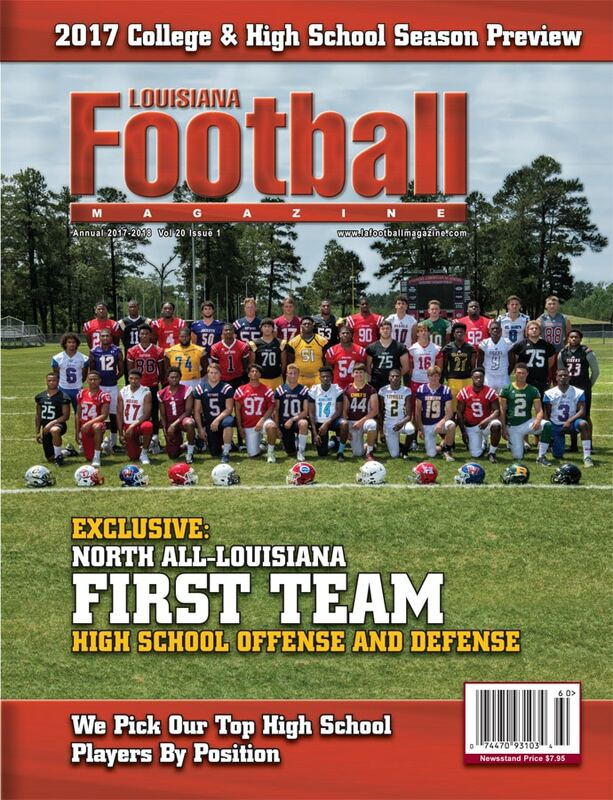 Hahnville’s Thomas Roscoe and Ruston’s Brandyn Reaser are two of the best in the state and both were on the cover of our North and South magazines before the beginning of the season. However, the wind played a major role in the game. Roscoe had two kicks blocked with the wind to his back, but he came up big making the third field goal to give the Tigers back the lead at 23-21 with just about eight minutes remaining in the game. Reaser, on the other hand, had a chance to get back the lead on a 40 yard field goal attempt late in the football game, but the field goal attempt was no good. The Bearcats did get a second chance in winning the football game as the Ruston defense did their job and gave their offense back with just over a minute left to go in the game. With no timeouts, the Hahnville defense kept the Ruston receiver in bounds forcing the Bearcats to hurry and spike the ball. They did manage to spike the football and give Reaser another opportunity this time from 45 yards to win the football game. The field goal was straight enough, but it wasn’t long enough as the Hahnville Tigers, led by Nick Saltaformaggio, survive and move on to play in the Class 5A quarterfinals to play against the #2 seed Covington Lions. #9 Barbe Buccaneers (10-2) defeats #8 Destrehan Wildcats (9-3) 22-14. Game Recap: The Barbe Buccaneers faced off against the Destrehan Wildcats in a game that features two of Class 5A’s best football programs over the last couple of seasons. As a result, the game was a very good one. In the first half, it was the Destrehan Wildcats that made too many mistakes offensively. The Wildcats’ offense turned the ball over three times in the first half. Both defenses played well, but it was the Destrehan offense that was hurting the team more with all of the turnovers. Like any good team does, the Barbe Buccaneers took advantage of those turnovers and converted them into points. At the end of the first half. the Buccaneers had a 15-0 lead against the Wildcats with the only touchdown occurring on a Dana Fontenot three yard touchdown run and three field goals by Mason Caldwell. In the second half, Barbe continued to extend the team’s lead to 22 points with a touchdown run from star junior QB Luke Richard who faked the handoff and took off running for a 38 yard touchdown. Just like a lot of the other 5A teams that were trailing in the second half, the Destrehan Wildcats finally moved the football down the field and got back into the heat of the action. The Wildcats got the ball back and were driving down the field as well, but the Buccaneers got another turnover as the Wildcats looked like they were going to score another quick fourth down attempt. Destrehan RB John Emery was stripped of the football, which was recovered by the Buccaneers. However, the exciting junior RB made up for his mistake running for a touchdown to put the Wildcats within eight points, but the turnovers and the slow start for Destrehan was just too much for the Wildcats to handle as the Wildcats turned the ball over on downs late in the football game to give the Barbe Buccaneers a 22-14 win. 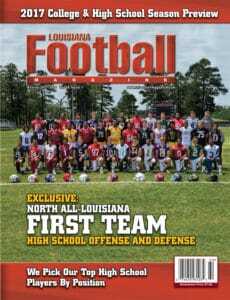 For the Destrehan Wildcats, led by Stephen Robicheaux, this was a great season by a great program winning nine games and a playoff victory. For the Barbe Buccaneers, led by Mike Cutrea, advance to the Class 5A playoffs to face off against the #1 seed West Monroe Rebels.